Our Cozy and Comfortable Condo has an oversized bedroom with 1 Queen size bed, 1 Full size bed plus a twin bunk bed on top. There is a kitchen, complete with dishes, and cooking utensils, and a table that seats 6. Full Bath, and a Dining Area - Living Room combo with Sleeper Sofa, and a Lazy Boy recliner. There is a working fireplace for cozy fires on those cool nights. We also have a 42" HDTV, DVD/VCR Player, Stereo System, Sliding Doors to deck, with BBQ grill. 2 large closets are available for storage. We have a selection of books, games and movies for your enjoyment. A Washer and Dryer is now available. We also offer free wireless internet access. The condo sleeps 6 comfortably. From the living room, you have a bright and sunny southern exposure, and direct views of Hunter Mountain. The outdoor pool is only steps away from your front door, and is open from memorial day to labor day. In winter time, enjoy a cozy night by the fireplace after a day on the slopes. Come on up and enjoy the mountains. Be sure to visit our White Mountains, New Hampshire Vacation Properties, 4 season resort. Located 5 hours from New York City with easy interstate highway access. 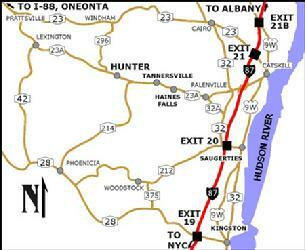 Directions from NYS Thruway : Take I 87, NYS thruway to Exit 20, Saugerties. After Toll Booth, Turn left at Traffic Light. Follow signs for Rt 32 North. Take this to Rt 32A. Take Rt 32A to traffic light. make left turn onto RT 23A. Take Rt 23A West thru Village of Tannersville. About 3 miles past Tannersville, Make a right turn immediately after Welcome to Village of Hunter Sign. This is Scribner Hollow Rd. Make a left turn at 2nd driveway entrance. Building is straight ahead. Unit D1-E is at western end of building. Additional Pictures of the Condo are below. Click on each picture to enlarge the image.